What we consider quiet is rarely quiet. Even when the world without has nothing to distract, the world within is constantly churning. This quiet chaos gives rise to a whole new world, as real as the world without. Presented here are a few reflections on a variety of topics, some based on the events of the day, others just musings of the mind from a time unknown. 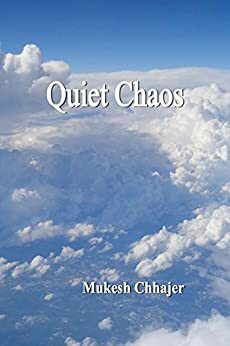 Poet Mukesh Chhajer teaches math and physics in Danville VA. With the addition of QUIEST CHAOS he has published ten books, seven poetry collections in both English and Hindi, a biography of Mahavir Swami in verse, and one book of essays on Jainism. Mukesh’s poems in this fine collection range form philosophical musings to thought-provoking questions as to the role of chaos in the manner in which we view - and live – in our world, to passing thoughts that remind us of the importance of how we observe and react to or environment, as well as personal reflections that tell us much about this fine young poet. As is always the case in discussing poetry it is always preferable to let the poems speak for themselves, and so the follow are a few examples. Before I started to read this book, I keep quiet right after reading the title, I give it a thought and then move on, as I keep reading these amazing lines, I came across the same thought, it’s interesting when we notice the ‘quiet chaos’ in our lives, and the very fact that we are the ones who make it real. Sometimes we own the chaos, some other times the chaos own us, it’s a matter of perception, but the real thing is, what we see as a ‘quiet place’ is our own thing, I can find peace and quietness in my room playing video games with earphones on of course, or reading a book, while ‘quiet’ for others might be something completely different. The real stuff here is the mind of the author, who immerses us in his mind and thoughts in this very well-crafted poetry. Such approach to words and the meanings beyond our imagination are compelling from a perspective of someone who doesn’t know him in person but can tell how his mind and feelings works, a highly recommend collection of fine words. Quiet chaos takes you through the experience of sometimes everyday moments we may find ordinary, and explains why they are actually extraordinary. He reveals power in common points of life but presents them in a beautiful way that allows any reader to be able to connect with his words. I found this very well done, especially when you consider his ‘day job’, a math and physics teacher, who could easily get very deep into the chaos, beauty and even quietness of the world around us. What I found really most inspiring, as a writer, is his tone and ability to develop his own voices. It is perfectly done and you get to know him very well throughout his verses. It allows you to connect deeper with the writer and almost develop a dialog as you read his poetry and start to think about these things and how they apply in your own life. Quiet Chaos by Mukesh Chhajer is a wonderful collection of thought provoking poetry. We dive right in on the first few pages into the author's mind, revealing itself with page after page. These poems run the gamut and examine life itself and our perception of it. Particularly appealing are the poems Struggle which tackles mankind's seeming inability to live life without preconceived ideas, while the poem, Generosity, appeals to anyone who loves nature, and appreciates our co-mingling with the Earth in our existence. Thoughtful and meaningful, these poems are revealing and beautiful to read. Purely written poetry that is surprisingly good, rendered with a light touch. Highly recommend.